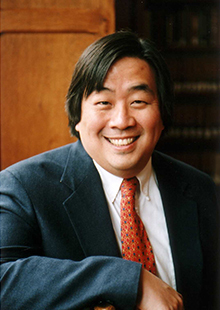 Harold Hongju Koh joins the School of Law as this year’s Carl F. Cranor Visiting Phi Beta Kappa Scholar. Prof. Koh is a former high-ranking official in the U.S. Department of State during two admistrations: specifically, he is the former U.S. Assistant Secretary of State for Democracy, Human Rights and Labor, and a former Legal Adviser to the department. He is currently the Sterling Professor of International Law at Yale Law School and served as the school's 15th dean from 2004 to 2009. Prof. Koh is one of the country’s leading experts in public and private international law, national security law and human rights. During this special event, Prof. Koh will discuss issues raised in his new book The Trump Administration and International Law (published October 2018). The talk will take place at noon on Friday, Nov. 9, in the John K. Pruellage Courtroom (12th floor) of Scott Hall. Co-sponsored by the Center for International and Comparative Law, the SLU LAW American Constitution Society, the Hispanic and Latinx Law Students Association, and the International Law Students Association. The program qualifies for 1 credit of Missouri Bar CLE. An opportunity to purchase the book and have Prof. Koh sign copies will follow. The program is free but registration is requested; a box lunch from Chris' at the Docket is available for purchase by calling (314) 977-4615. Students who register in advance will have a pizza lunch available on the 11th floor at 11:30 a.m.
Koh will be giving a presentation of the same title at 7 p.m., Thursday, Nov. 8, at the Saint Louis University Center for Global Citizenship, for those interested and unable to attend at the School of Law. Sponsored by the Phi Beta Kappa Society's Visiting Scholar Program.